Machined from the highest grade aircraft billet aluminum for maximum durability. The deep precision groove ensures belt retention even during extreme changes in RPM. Pulley is hard-coat anodized for extended life. Designed to be used with a .5313" wide x 36° V-belt. 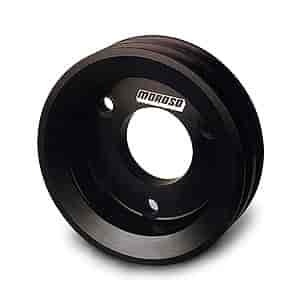 Produced from high-strength cast or billet aluminum, these pulleys feature a deep groove for improved belt retention at high rpm. Moroso offers alternator pulleys, crankshaft pulleys, power steering pulley and vacuum pump pulleys to fit many popular engines.